The lower Mtn. Fork River is a recreational river, however, subject to power in demand, hydropower releases effect the levels of the river. We check everyday and generally, it doesn't interfere with your plans. ITS ALWAYS BETTER TO CALL AHEAD....AND BOOK A TIME!! CLOSED MONDAYS. Open April 20 & 27 (which are Saturdays) and Full open MAY 1. If outdoor fun is your thing and you love kayaking then come and enjoy Mother Nature at its finest on the beautiful Mtn. Fork River in southeastern Oklahoma. Bring your family and friends for an adventure you won't soon forget. 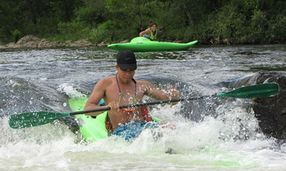 Contact Yippie Kayo Kayaks for a trip down one of the most pristine rivers in the four state area. Lined with cypress trees hundreds of years old, gorgeous scenery and abundant wildlife, this is a trip YOU WONT WANT TO MISS!!! The falls section of the river offers a class 2+ rating when the river is right. (History fact: Trail of Tears went through this area.) We have to check the water release schedule the evening before you float to make sure the river is at a safe level. When you arrive at Yippie Kayo Kayaks you sign in and pay. Your vehicle stays on our property, we take you to the start of your trip, the reregulation dam. This trip takes approximately 3-4 hours depending on how long you pull over and how fast you paddle. Bring a picnic or snacks!!!! Please take your time and ENJOY the scenery and all this river has to offer. Age limit 7 yrs. The first area you will float through is called the rock gardens. Then on to the chute (perhaps the most challenging part) as you cascade down the 2- 1/2 foot waterfall called Presbyterian Falls. Continuing on, is a gravel bar on the right side of the river. This is Cooper Creek. A little further down, exit on the left side of river, just past the newly built bridge. Pull boats out on south side of wooden fence at Skippa Rock. We appreciate your business!! NO ALCOHOL IS ALLOWED ON THIS PART OF RIVER! ABOUT YOUR DOG...smaller dogs are okay, large dogs..a bit more unsteady. A life jacket is a good idea! If you or your kiddo's jump off of any swings, please be careful. Sometimes those ropes are old and not sturdy. If you are needing a ride you could call Roberts Rides and if you have kids or fur kids you can call Kids and Critter Sitters if you so desire...WE ARE HAVING A DRAWING TO WIN A JACKSON KAYAK OR $200 (your choice). FLOAT WITH US, ENTER YOUR NAME, TOWN & PHONE# ON A TICKET, PUT IT IN OUR GLASS VASE. Must be 18 to enter. Enter every time you float. SEPT. 1, WE WILL DRAW THE WINNING TICKET. We will notify you by phone. GOOD LUCK!!!!! PLEASE LIKE OUR FACEBOOK PAGE!! SHARE AWAY & Thank You. See you soon for an adventure of a lifetime! !